Hubspot define personas as “fictional, generalized characters that encompass the various needs, goals, and observed behavior patterns of your ideal customers”. So how do you define ‘candidate’ personas? Well no prizes for guessing here. Replace the word ‘customers’ with ‘candidates’ in the Hubspot definition and there you have it! You need to have a full understanding of your candidate personas and the way in which those candidates arrive at decisions as this information is fundamental in designing a content marketing strategy that will meet your organisation’s recruitment goals. Developing candidate personas allows recruiters to identify core candidate segments, understand their goals and tailor content to match. This means focusing on the most relevant channels, speaking the candidate’s language and building relationships. Without this intelligence, your recruitment messaging will be totally lost which means much less engagement, making a recruiter’s talent acquisition process more difficult. 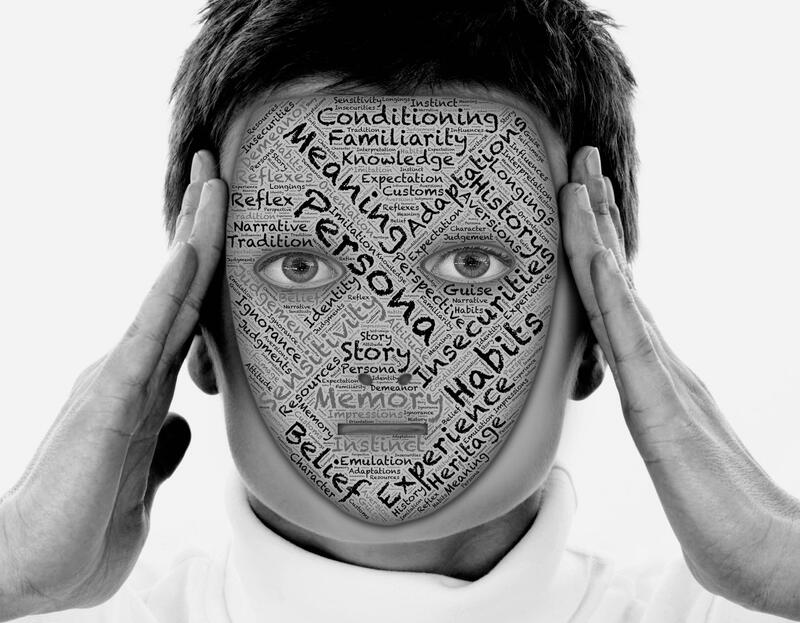 Personas are typically explained through outlines, short paragraphs, photos and even PowerPoint presentation. Below is a basic example of a candidate persona. It is important to note that this is not an extensive evaluation of a candidate by any means so you will need to go beyond basic information like name and skills. The current state of the job landscape is very much symptomatic of this recent behavioural transformation of candidates, with many recruiters realising the importance of ‘inbound recruitment’ and how it can help them engage and recruit the right talent for their organisation. The huge upsurge of social media and content marketing coupled with falling unemployment rates and increased job opportunities means the control is now in the candidate’s hands. In other words, a typical candidate is now behaving like the modern consumer, by researching companies online, gathering information and ultimately deciding on applying for a vacant role. So much like marketing teams, recruiters have to get a comprehensive understanding of the types of people they want to market to. The first step in this is attempting to map out your candidate personas. LinkedIn: The most popular professional network in the world with 400+ million users. If you are an avid networker on LinkedIn and we hope you are, you will know the value of building and managing a quality network. Most users have their profiles filled out which includes information on work experience and education. This is useful information when mapping our your personas. Recruiters should go beyond this however, and find out what influencers they follow, what LinkedIn groups they are a member of and what content they share. Based on this, recruiters can get a good idea of how they find new information, the publications or blogs they read and who they most respect. Standard Interview: If you know people in your network with similar roles to the one you’re advertising for, it may be worth to reach out and interview these people in order to get an insight into their interests, skills and job searching preferences. A really good source of information could be the candidates you have already hired for similar roles – make a conscious effort to understand their background. Network: Simple things like attending corporate events and talks that you usually wouldn’t attend can go a long way in helping you understand your ideal candidate. You are bound to bump into someone who fits your persona so this is the perfect opportunity to show a genuine interest in getting to know them. You need to gain deep insights into your potential candidates and try to uncover their needs. This means getting data on their demographics, challenges they face, current job information, job searching preferences and more. It is good to ask a diverse range of questions which will give you a better understanding of who this candidate is. Below are an extensive list questions you should try and find answers to. Please bear in mind, you will probably not be able to find answers to every single one of these questions but the more information you have, the better the representation of your ideal candidate. 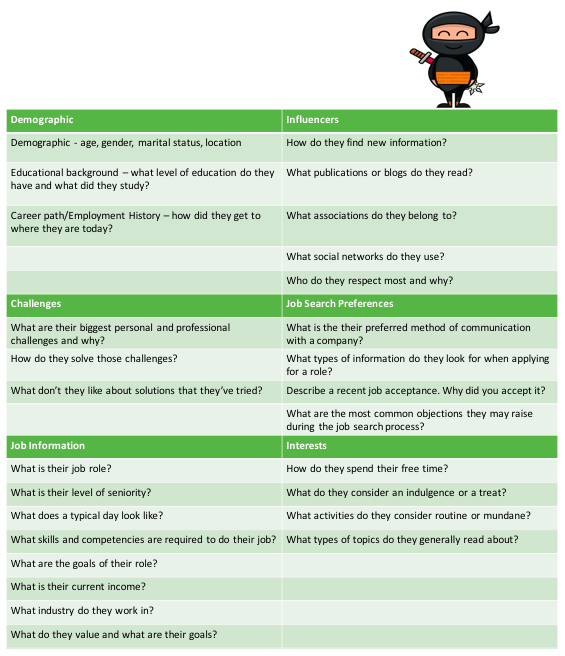 Analysing the questions above, it is safe to say that many recruiters would be guilty of examining only a maximum of 3 of the above categories (mainly Demographic, Challenges and Job Information) but tackling each of these categories individually will give you more of a rounded view of the candidates you are trying to market to. You’re going to have tonnes of qualitative data after exploring all of the areas above and initially it may seem a bit overwhelming. The best way to bring structure to this data is to take the time with your team to carefully go through it all and identify any recurring themes or patterns. One recommendation from us is to include as many team members as you can and not to exclude colleagues from other functions. Getting different perspectives will help you as a recruiter to nail down the characteristics that your ideal candidate would have and that are important to your organisation. Once you start finding commonalties, your goal is to synthesise this information and create a template for your persona (see above Customer Experience Chloe). You will quickly see the opportunities here to create pitches for candidates that really hone in on their pain points, objectives and goals. These pitches can be reused across all your recruitment channels like job ads, social, email etc. The template you create should be passed around your organisation to give your colleagues a clear understanding of the type of candidates you want. Using this information, they can include this in their messaging when they start promoting the vacancy on your behalf. Remember to have some fun with it – give them a fictional name and find a suitable picture for them. This will add a bit of personality and a very ‘real’ element to your candidate. Each candidate persona should guide your decision-making and messaging. Well that’s it! This the first step you need to take when you want to make a hire: research and document your ideal candidate extensively! It’s important to remember that the personas you are documenting are constantly evolving so they will be subject to changes as you meet and interview more people. The more changes you make, the more precise your candidate persona is. Needless to say, developing your candidate personas is a very worthwhile activity as it can help you automatically tailor your content and messaging. This activity is synonymous with the new era of inbound recruitment which, if done right, can pull more passive candidates in, leading to more applicants and successful interviews. For more tips on candidate engagement, check out our blog post on 10 Interview Questions You Should Never Ask a Candidate. Taking a job briefing from the Hiring Manager is your opportunity to learn everything and anything you may need to know about the position and the person needed to fill it, so that you have the knowledge and insight to go out and find the right candidate for the job and company. However, although it is one of the most important facets of the recruitment process to get right, how to take an effective job briefing is one of the trickiest skills for a recruiter to master and is, more often than not, done incorrectly. If you have any chance of finding the right candidates for a tech role, you need to ask the hiring manager some probing questions (in the nicest possible way, of course!) Check out the 10 questions we recommend that you ask a hiring manager when you're recruiting for a tech role.